When you start thinking about wedding invitations, it’s easy to veer from excited to overwhelmed and back again. There are so many beautiful options (Letterpress! Gold foil! Engraving!). You have a limited amount of time and money to devote to your wedding invitations, and you need to make some sanity saving decisions quickly! From an overview of printing styles, to cheap wedding invitation options, to everything you need to know if you want to DIY your invites, we’re here to reduce the number of tears shed over these pretty scraps of paper. Thinking about your wedding invitation wording is a great way to get started on the whole project. As you and your partner discuss wording, you’ll start discussing things like tone as well. Are you creating very formal wedding invitations? Are you going a little non-traditional? Is your wording light hearted or irreverent? Once you get a sense of your approach, you’ll also start to get a feeling for what you want your invites to look like. Those formal invites might be engraved on cream paper, while your whimsical text might come with quirky illustrations. But remember, when it comes to wedding invitations, form always follows function. No matter how creative or outlandish you get, the basic goal is to convey who/ what/ where/ when, in a format people understand. This overview of how wedding invitations are usually worded, along with a ton of examples, should get you started. Thinking of doing DIY wedding invitations? Great. The vast majority of the APW Editors took on this particular labor of love, and we want to get you through it without tears. Here is an overview of everything from printing options, to paper choices, to design tools… along with some tips on how not to make the mistakes we made. (Be unique! Make your own errors! Go forth and print!) If you’re planning on actually designing your own invitations, get started with our graphic design 101 series, which will walk you through invitation creation from pixel to press. Plus, just to make the details a little easier, here are collections of some of our favorite free fonts. (Because no, you don’t have to use what’s available on Word. Not that we personally knew any better…) And finally, if you’re wanting to print your own invitations at home (or at Kinko’s!) here is a wedding invitation printing guide to keep you sane. If you have thousands and thousands of dollars to spend on your wedding invitations… well… frankly… you don’t need our advice. 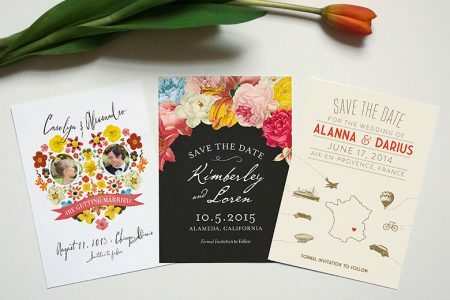 Wedding media is chock full of super beautiful wedding invitations that cost more than a small car, so you should just go pick the prettiest option. But the good news is, there are more and more amazing wedding invitations that damn affordable. (I mean, gold foil is now and option, you guys.) Here is a collection of some of our favorite cheap wedding invitations, from some of our favorite sources. I mean, look. We’re sorry in advance. People are generally terrible about RSVPing… even people who know better… even to weddings. So at some point you’re going to have to start tracking people down. (See this open thread on RSVP drama to make you feel like you’re not alone.) To set yourself up for as much success as possible, however, here are our best tips and tricks to getting people to RSVP.